A retro sci-fi puzzler that muddles its highlights with busywork. Tartarus shows off some excellent puzzles aboard a disappointingly empty spaceship, but it’s usually more charming than frustrating. I don’t know anything about IP addresses, but that doesn’t seem to be slowing me down. I reconnect broken network connections in the glare of an ancient CRT monitor, typing heavily on a mechanical keyboard in deep space. I’m the only crewman free to move around the RMS Tartarus, a crippled corporate mining ship floundering in orbit over Neptune. I’m the ship’s cook. 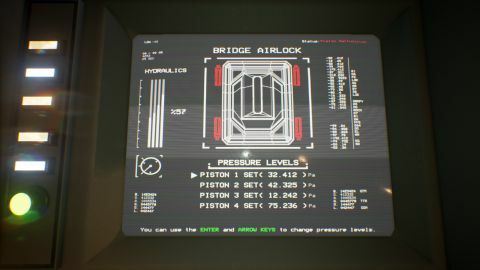 Even so, I’ve spent hours running from the bridge to the reactor room to the cargo bay, doing jobs I was never trained to do on computer systems more archaic than futuristic. Tartarus is my favorite sort of science fiction: it’s a story about people and a crisis that just happens to be set on a spaceship. It’s about people working dangerous jobs with equipment that company management won’t pay to upgrade. Though it shows a lot of promise, Tartarus is also too short, and its overall lack of polish and some questionable design decisions show how hard puzzle games are to get right. Tartarus’s grungy, retro sci-fi look is heavily inspired by the Nostromo from Alien. There are no sleek curves or Star Trek-style touchscreens here; everything is pipes, steel, keyboards, and wires. It’s a practical ship built on the cheap to make profits, like a deep sea oil rig that flies. The Weyland-Yutani fetish is more than an affectation; manually turning valves and plugging through ancient computer systems is the heart of the puzzles Tartarus needs you to solve. Most of the puzzles are solved by man-handling programs inside of the Tartarus’s old-fashioned command line interface. If you’ve never worked inside a command line, that’s not surprising, but imagine trying to re-organize your iTunes library without a monitor, and you’ll start to see the edges of the challenge. I’m not a programmer or a command-line aficionado, but I found the terminal language in Tartarus easy to pick up. Type LIST to see all of the files and folders in your current directory; type SF [folder name] to go into that folder, then type LIST again to see what’s in there. If you hit a dead-end, type SF.. to go back. RUN a program if you find one, OPEN a .txt file to read it, and SCAN ship sectors to see what systems you might be able to CONNECT to. Opening a new tab to consult Wikipedia or pressing the calculator shortcut key on my keyboard is so second-nature to me that I don’t consider them miraculous at all. In Tartarus, I ended up using a notebook, pen, and the calculator on my (real-life) smartphone, and when I was crunching through a thick terminal puzzle in Tartarus, I was having one of the best times I’ve had in a puzzle game in a long time. My favorite puzzle had me crawling around the ship’s navigation/command room rebuilding a primitive terminal network, pinging IP addresses and consulting my notes for MAC hardware IDs. When lights started to go green and the network started to come online, I felt like an absolute genius, a savant discovering a new talent in a moment of crisis. Many of the puzzles are also very difficult—almost punishingly difficult. For the most part, if I got stuck I found that if I took a break and came back the next day, I’d eventually solve the problem with fresh eyes. There was only one terminal puzzle that I had to solve by sheer brute force. For the most part, I relished the challenge any time I was near a keyboard. I always had fun in a terminal, but I never had fun in a hallway, and I got stuck there twice as often. If the entire game took place inside the computer terminals, I would be a very happy cook-turned-computer-genius. Unfortunately, about half of the puzzles involve wandering the empty halls of the ship itself, looking for hatchways or lost items. I always had fun in a terminal, but I never had fun in a hallway, and I got stuck there twice as often. To be fair, I’m the type of person who gets lost in linear FPS levels. When I hit dead ends in games like Doom and Wolfenstein I can spend half an hour walking in circles before realizing there was a door just behind me. Tartarus is a huge, city-sized ship full of empty space to run across, and so of course I got lost. But besides my own superhuman ability to get turned around inside a pair of jeans, I was hamstrung in a couple of places by doors that could only be opened when I stood in front of them at the right angle and the right distance. When I walked by too close and couldn’t open the door, I’d continue on my way and complete another lap of Tartarus Olympic Stadium. As I walked patiently around Tartarus to get in my 10,000 steps for the day, the magic of the place started to wear thin. The phrase 'a mile wide but an inch deep' kept popping up in my mind. There are so many doors that don’t open. Why can I climb some ladders but not others? There are so many computer terminals that I can’t reach because they’re not part of the game’s linear path; they only exist to be decoration. For as much as I loved the virtual space inside Tartarus, I really couldn’t get along with the physical space at all. The story and the puzzles that I loved so much would have been better served on a ship the size of Serenity rather than a city-sized hulk like Red Dwarf. I wrapped up Tartarus in about six hours, and sadly I don’t think playing it again would be as much fun. I also had some issues with the graphics in Tartarus. In particular, I seemed to get some rough screen tearing and artifacting. Updating drivers and tweaking anything I could didn’t seem to help. Luckily it wasn’t too distracting, and it was only noticeable while walking through well-lit parts of the ship—which is actually a pretty rare occurrence, what with the ship being on emergency power and all.